Discussion in 'Hair Care Tips & Product Review Discussion' started by Browndilocks, Jan 7, 2019. We are having a nice sunny day today, so my roller set hair is down and free. Cant really tell from the back because of the bad lighting in my bathroom, but there are still a few curls left. They have just been stretched out with that twisted bun I did a few days ago. MileHighDiva, I Am So Blessed, isobell and 20 others like this. Are you all lighthanded with your leave ins when putting in the rollers, or is it ok to M&S normally? If I'm going to be setting, my whole wash day process has to be quite light on product. I'll use a bit of setting lotion and water, and that's it. blazingbeauty, GGsKin, ElevatedEnergy and 1 other person like this. It started raining while I was out running errands yesterday. I've learned to always keep a few hair essentials in my purse. keranikki, SuchaLady, blazingbeauty and 4 others like this. Beautiful sis, and yes a natural must always be prepared! I keep a satin scrunchie, bobby pins, a flexi-8, 1oz of argan oil and always have my scarf! Rina88, ElevatedEnergy and faithVA like this. Still wearing my roller set down and it is 10 days old. I need to put it in a braid, but I dont want to. Garner, Daina, GGsKin and 1 other person like this. This is why I am a believer in roller setting. When you want to retain that length, setting is the way to go. Look at how smooth those ends are. You cannot get that with blow drying. 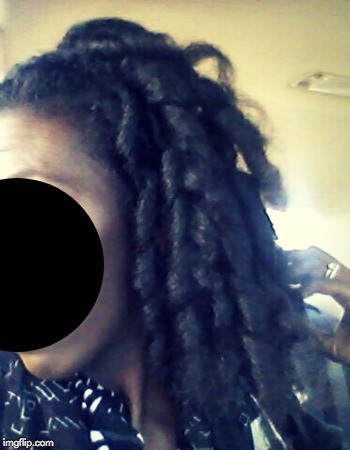 Roller setting really does strengthen the strand and help your ends become extra nourished. I rolled my hair this time in 4 sections. It was okay... I like my double roll mohawk way of setting better. I used purple rollers in the front and gray in the back, only because I ran out of purple rollers. MileHighDiva, I Am So Blessed, ckisland and 15 others like this. 4 - Lottabody mixed with water and a little bit of CON Honey setting lotion. SuchaLady, LushLox, blazingbeauty and 4 others like this. Nice Set! I've been singing the praises of roller setting over 15 years now. I was able to transition slowly without sacrificing length. sharifeh, blazingbeauty, Daina and 3 others like this. Currently under the dryer with a Magnetic Roller Set now. I wore my hair in its natural curly state for the past 6 days and I noticed I have a few extra ssk's while I was setting today. I'll cut them out once my set is dry, but I wont be wearing my hair curly anymore unless I absolutely just dont feel like setting. Curly ends for me equals less retention & Momma's got goals to reach. It will probably be too dark in my house tonight for pictures after the roller take down, but I will snap a few whenever I wear my hair out. The plan is to apply a small coating of Whipped Shea Butter, cross wrap then wear a cute turban for the next few days. SuchaLady, Daina, faithVA and 6 others like this. A little late with this one, but I recently tried Curlformers for the first time. I like that I am able to do other stretched styles once the curls fall since it's virtually straight hair. MileHighDiva, I Am So Blessed, isobell and 16 others like this. @ElevatedEnergy Hi!!! Tell me when you roller set do you use a small teeth comb to comb hair smoothly on the rollers? Ladies, your roller sets are beautiful. I used to do this in my relaxed days. It would be wonderful to get a week or more out of a good rollerset. faithVA, ElevatedEnergy and firecracker like this. isobell, ckisland, mzteaze and 10 others like this. Garner, BeautifulRoots and faithVA like this. Hi Sis!!!! I use my fingers only while setting....which is why I prefer my Magnetic Rollers to all other types of rollers I have. I roll, pull, roll, pull...repeat until the roller hits the scalp then secure it. *I do use a wide tooth comb or my wooden TEK brush to maintain the set in between wash days though. I just dont like using tools on my wet hair. Garner, keranikki, Daina and 1 other person like this. Beautiful roller sets ladies. Thank You for sharing. Had to take my cross wrap down as I didnt do a good job on bobby pin placement, and they were annoying me. Left pic shows my hair after using a flat iron to straighten then maintaining it with a bantu knot bun. Right pic is my roller set from yesterday and sleeping in a cross wrap. I honestly have no reason to use my flat iron on my hair anymore. I get the exact (even better results) from roller setting. I get the smoothness/straightness with body. MileHighDiva, isobell, Garner and 14 others like this. keranikki, faithVA, Daina and 3 others like this. Love it! I haven’t done a roller set in so long. I just haven’t had had the patience to do it and sit under the dryer. Lucky that you can get straight ish results with just a roller set. faithVA, Daina, ElevatedEnergy and 1 other person like this. Thank you! I need to do better about sitting under the dryer long enough for it to thoroughly dry. I'm always up and down when I'm supposed to be drying it, so this set came out a little crinkly in some spots. faithVA and Daina like this. I really need a new dryer. I'm still using my LCL professional dryer, but the pole broke 5 years ago & I've just been rolling with it. My husband put a pole from a broken fan to help it stand up, but it's doing the gangsta lean right now. I may replace it next month or get a dryer thats attached to a chair that I don't need to move around. Garner, mzteaze, keranikki and 2 others like this. @ElevatedEnergy, beautiful as always sis! If you could sit uninterrupted under the dryer how long would it take you think? I'd love to roller set but after my hair got to MBL it was very difficult to set certain areas and my arms would get too tired. I would get frustrated and put the rest in any ole kind a way - which ultimately defeated the purpose so I stopped. I'm almost HL now so how you do it on TBL plus hair is truly amazing! Also the dryer time...between the kids and dh at best I might get 45 minutes to an hour. faithVA and ElevatedEnergy like this. Thank you Sis @Daina It usually takes around 1 hour and 15 mins. I then turn my dryer on cool for an 5 additional mins. So in total 1 hour & 20 mins. I try to sit under there when the kids are sleep or when DH has them. In this case, they were sleep when I got under the dryer but woke up from all the noise of the military base near us doing fireworks for Presidents Day. Grrrrrr. Garner, faithVA and Daina like this. Took my cross wrap down and rocked a ponytail this morning. To give it character, I put in 2 braids and wrapped them together & pinned them towards the top of the ponytail. MileHighDiva, I Am So Blessed, isobell and 11 others like this. Love your wrap around braid! Besides the broken pole how do you like the LCL dryer? I'm considering purchasing a professional rolling style dryer and I'm trying to decide between LCL and Pibbs. Absolutely love it. It's 10 years old and still kicking. The cost of the Pibbs made me lose interest quickly. Especially when there is something comparable for a fraction of the cost. If it were my coins, I'd pick the LCL. Rina88 and BeautifulRoots like this.